Yesterday was one of the first nice days of the year, weatherwise. So I went out to paste. 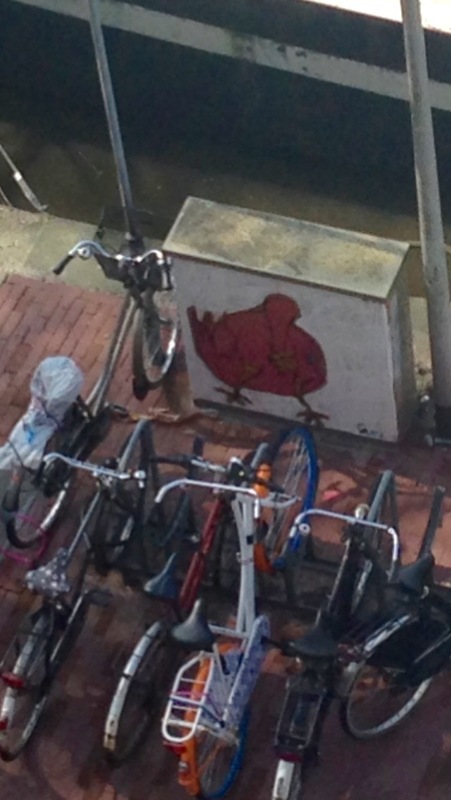 I had been pasting a couple of days this year, but yesterday everyone was outside in Amsterdam. When I was done with this one bird, I heard someone shouting HEY and I looked up. This guy hung out the window high up in a building and shouted something like ‘thank you!’. We had a little shouting and I shouted my name, so he could look me up. When I was packing my bike to leave I saw him busy on his phone, he had found me on the web. ‘I took pictures’ he shouted, and I shouted back that I would love him to post them to me. Newer Post Home is where the artist. 15, Costa blanca, Spanje. Older Post Home is where the artist. 14, Hilversum.